We're just back from a Northern Lights cruise on Viking Ocean Cruises' Viking Sky, which visited various ports along Norway's coast, heading into the Arctic Circle. Visiting a cold-weather destination in the heart of winter isn't everyone's cup of tea, but for those willing to brave the sometimes-frigid temperatures, the payoff could very well be a big check off your bucket list. That is: spotting the rare and beautiful natural phenomena of the northern lights, also known as the aurora borealis. We set out in mid-February on a 12-day cruise that took us from Bergen, Norway to Tilbury, England with stops along Norway's west coast. This is the first time Viking Ocean Cruises has offered a winter itinerary to Norway in search of the northern lights, and the voyages saw brisk sales to passengers from all around the world. (Our cruise featured mostly Americans along with a healthy dose of Brits and fun-loving Aussies.) Viking has already committed to more sailings in 2020 and is looking ahead to 2021 and beyond. Tempted? Here's what you can expect on a Viking Northern Lights cruise. We were lucky: We saw them on our third night onboard Viking Sky. They made two shy appearances before putting on a dazzling display just after 11 p.m. as we sailed toward Alta. We were a bit surprised to learn that they're not so easy to see firsthand. Rather than the vivid greens you see in photos, they tend to show up as lightly colored strips across the sky. Many people saw them through their high-quality digital cameras before actually seeing them with the naked eye. If the northern lights come out late at night, when most people are sleeping, Viking will play an announcement over the in-cabin TVs. Passengers have to opt into the announcements by leaving on their TVs, tuned to the bow-camera channel, while they sleep. We left our TV on the first couple of nights, but after we saw the lights, we slept better with the TV off. We did miss a 2 a.m. announcement near the end of our cruise because of our decision. Other passengers reported sleeping with a "go-kit" -- warm clothes and camera gear -- at the ready so they could jump out of bed and bolt to the top decks when alerted. While the northern lights were the main draw onboard, the Norwegian scenery was equally incredible. Sailing through the fjords is a jaw-dropping experience, featuring snow-capped mountains, tight squeezes between cliffs and lighthouses galore. Through it all, Viking crew provided narration when necessary and prompted passengers where to go to see the best vistas. Crew also made the experience far more pleasant, with waiters handing out mulled wine or hot chocolate to passengers who braved the cold. For many of the onboard staff, the northern lights were exciting as well, and because many of them had seen them on previous cruises, they were eager to share their photos with passengers. They also were willing to share their knowledge of the best apps for taking pics of the lights, even grabbing phones and adjusting settings for passengers (like us!) who were fumbling. (Likewise, Viking printed up a list of tips for shooting the lights, created by the line's resident photographer, Alastair Miller.) Viking Sky's staff was stellar, and we felt well cared for regardless of where we were spending our time onboard. Maritime traditions are part of virtually every big sailing, and ours, which took us into the Arctic Circle, was no exception. To celebrate Viking Sky's crossing, the staff put on an Order of the Blue Nose Crossing Ceremony the day we made it into the region. At least 100 passengers took part in the hilariously fun process, plunging into a converted hot tub with ice-cube-filled freezing water, emerging to get blue-tinted frosting dabbed on their noses, then downing a shot of rocket fuel -- er, aquavit, a Norwegian spirit. Crew showed up dressed in togas, while swimsuit-clad passengers celebrated together. Despite the early time (10:30 a.m.) the party atmosphere was festive and fun. 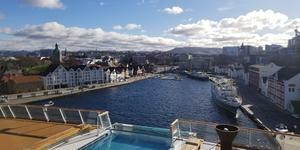 Our cruise visited Narvik, Alta, Tromso and Stavanger. (Sadly, our scheduled stop at Bodo was canceled because of high winds, so we got a bonus day at sea.) We overnighted in Bergen, Alta and Tromso, which gave us the chance to explore these cities on our own in addition to booking multiple excursions. While all Viking cruises include one excursion in each port, we elected to book some of their premium offerings as well as some independent tours. We truly loved everything we booked, and we thought Viking's excursions included a nice mix of options for everyone: history buffs, adventure-seekers, culture collectors and traditionalists. Our choices ventured into the more active territory, with a terrific cross-country skiing adventure as well as a visit to a husky sled dog spot that had us mushing across the tundra and cuddling with these amazing pups. Everyone we spoke with was happy with their excursions, whether they booked premium selections or opted for the included panoramic city tours. While Viking clearly put a lot of thought into making sure all the big things -- from itineraries to activities -- were perfectly scheduled, it was those little things that really made our cruise. The weather during our cruise ran from well-below to just above freezing, so the ship's main pool was covered by the retractable roof the whole time, which made it a comfortable, usable space. Viking Sky's gorgeous infinity pool at the back of the ship is uncovered, as is the adjoining hot tub. Those who dared brave the cold to soak in the views were rewarded with a glass of sparkling wine upon entering the hot tub and hot towels when they finally emerged back out into the frigid temperatures. Most public spaces on the ship offer plenty of throw blankets, great for bundling up after a cold day in port. And we've never been so thankful for the cabin bathrooms, which feature heated floors. Viking also offers complimentary self-service launderettes on each cabin deck. 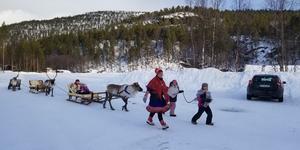 These became a necessity for most passengers, who wore multiple layers every day, often seeing them soaked through or dirty from interaction with wildlife, like reindeer. It made packing easier, knowing that washing your clothes was an option. The 2019 sailings sold quickly, so Viking is offering the same itineraries from January through March 2020, onboard Viking Star. If you're thinking of booking one of these cruises, be aware there is no guarantee you'll actually see the northern lights. We were thrilled to have seen them, especially after reports that people on the previous cruise hadn't been so lucky. Earlier cruises (which we followed on Cruise Critic's Roll Call pages) had seemingly countless sightings. The lights are unpredictable, but we booked knowing a sailing at this time of year would offer our best shot to see them.